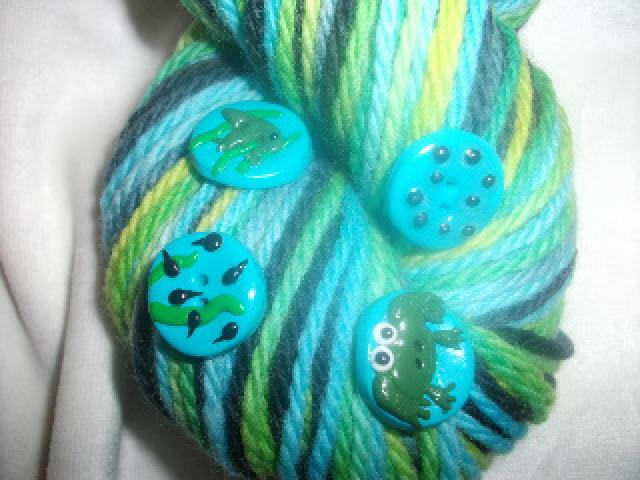 Beautiful hand made "frog lifecycle" buttons made by stacey at "Smiggles" and 200g of standard merino aran dyed in my "ribbit" colourway! If you would like this wonder please say below! Oh, lovely. I just got some of those buttons too. They're fab. I will pop up a listing for you tomorrow on the store! Eleanor, did you want the trim as well? how about a knitted waistcoat? Share To Knit To Woo- One for the boys!